Home > 40s > beers > bum wine > malt liquor > podcast > The BWB Podcast Goes LIVE on 2/1/15! The BWB Podcast Goes LIVE on 2/1/15! Did you hear the news? It was announced this past weekend that the official Bumming with Bobcat Podcast will be going LIVE on Super Bowl Sunday, 2/1/15 at 11AM EST! What better way to kickoff your Super Bowl Sunday by talking bum wine, beers, 40's, malt liquor, and MORE! As of right now the plan is to run a 30 minute show each Sunday morning and hopefully expand in the future. The BWB Podcast is the perfect hangover cure, and the best way to wake up after a Saturday night of drinking! Don't forget that our show is also the perfect lead in for our friends over at IWS Radio who host their show at 12 Noon EST! The pilot episode is online! 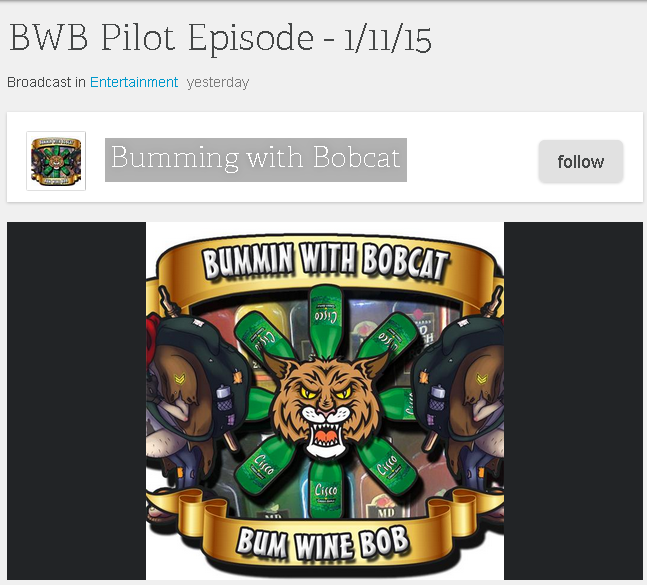 You can check out the official pilot episode with of the Bumming with Bobcat Podcast here. We were still testing out the show features, and just wanted to make the official announcement before we go live on 2/1/15! Listen to "BWB Podcast Pilot Episode" on Spreaker. The details and topics of the first show are still being finalized, so make sure you stay tuned for additional updates. Would you like to be a guest on the show and share some drink recommendations or drinking stories? Let me know and we will get you on the show! Cheers!